Coleman's work is displayed alongside works by Nicole Eisenman, Byron Kim, Thomas Struth and others inspired by the Renassiance. 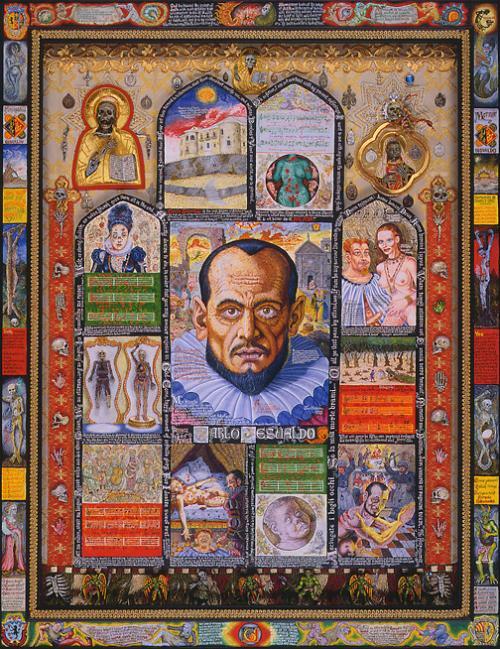 "Joe Coleman’s Portrait of Carlos Gesualdo is perhaps the artist’s most explicitly conceited painting to echo the structure of medieval forms of narrative imagery, since here Coleman portrays the medieval composer-murderer within a structure meant to suggest manuscript illumination, altarpiece or stained glass window. Coleman’s legendary obsession with violence, the grotesque, death, and pathos, influenced by a range of artists from Bosch and Breughel to Goya, is noted by a selection of Goya’s etchings from the Disasters of War."